For special occasions, Carla and I usually go for a mix of fish for celebratory dinners. It's something of a seafood-centric mixed grill, with a nice piece of seared fish, sauteed squid, scallops, and perhaps broiled oysters if they look good. For New Year's Eve, we decided to do something a bit more exotic. 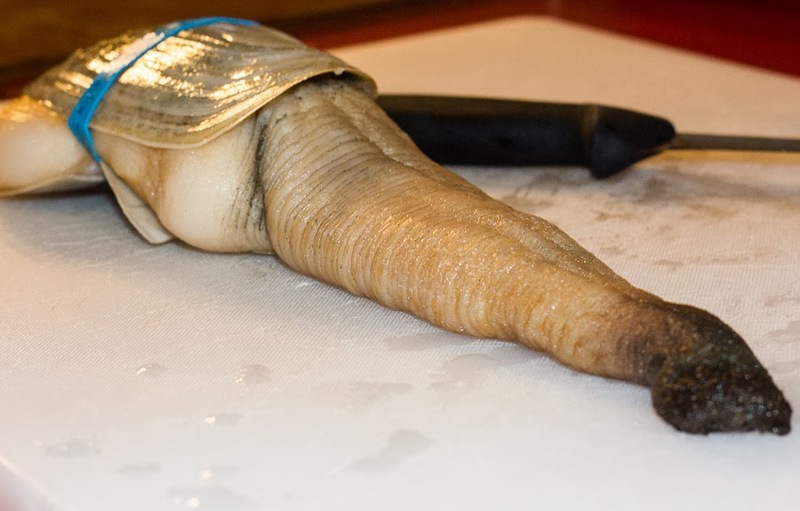 This frightening monster is a geoduck, which is pronounced gooey-duck. Harvested from the pacific Northwest, these clams take their odd name from an old Native American word for "dig deep." They burrow deep into the mud of saltwater sounds, with the long siphon protruding out and eating plankton. In the wild these clams can live for 140 years and become enormous. You can find some great geoduck videos on youtube of locals digging up these enormous clams from 5 feet deep in the mud during low tide. This particular geoduck came from Taylor Shellfish, a sustainable shellfish farm in Shelton, WA. Weighing in at just over 1.5 lbs, it seemed more than substantial to serve the two of us. 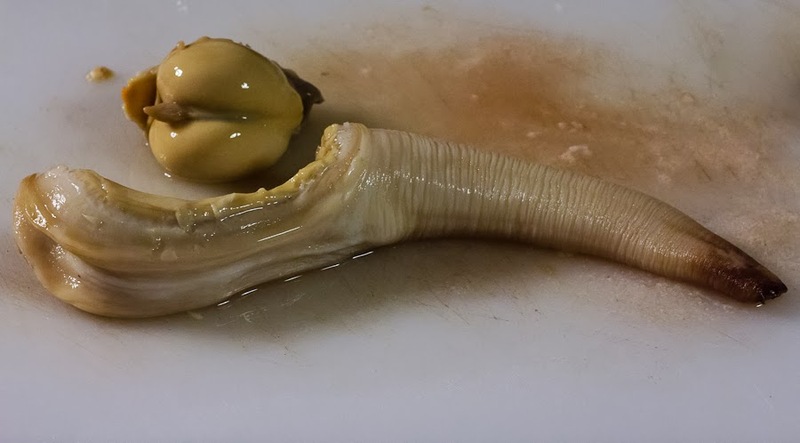 The geoduck is alive, with the rubber band around the shell mimicking the pressure it would normally receive from the surrounding mud. Although the siphon/neck looks dirty, it's covered by a thick membrane that comes off cleanly by blanching it in boiling water for 15 seconds, then dumping it in an ice bath. From there the outer membrane peels off in a meter-long stocking, which is a good indication of how long these things can be when fully extended. The neck itself has a clean, clammy flavor, with a very crisp texture; like sea cucumber. Many recipes show this being served raw, sashimi-style. 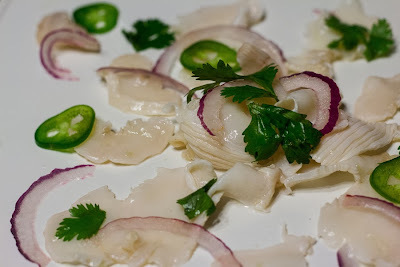 The meat is really nice raw, but I wanted to go a slightly different route with a geoduck ceviche. I sliced the neck meat thin, then swished it around in lime juice for about a minute. This was plated with thinly sliced red onion, cilantro, and jalapenos. Carla especially loved this dish, with the bright, herbal, spicy flavors mixing with the clean, crisp meat of the clam. The soft belly has a much stronger flavor, like a big quahog clam, but a very tender texture. 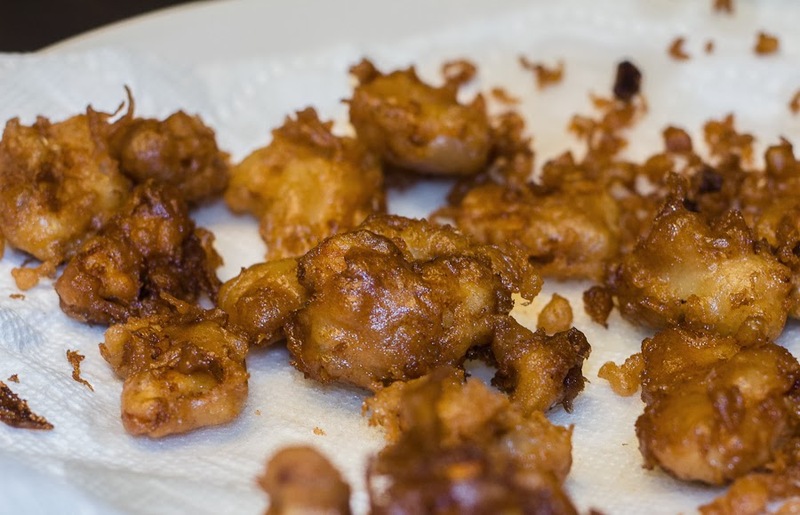 Some recipes recommended this for clam chowder, but I thought fried fritters would be nice. Plus, my mom always made fried smelts for New Years and this reminded me of her. I made a loose batter, using tonic water to add carbonation and a puffy texture. The geoduck fritters were also good, with the full flavor of the clam contrasting against the tender meat. I liked the fritters, but they didn't seem as intense and special as the siphon meat. So here's to an adventurous start in 2014! Wishing you all a great, exciting, challenging, and amazing New Year! Is the Geoduck alive when you boil it, or are they already dead by then? 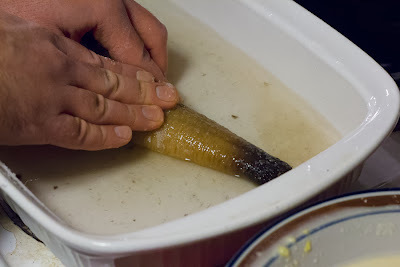 The Geoduck is alive when it goes into the boiling water. Like dealing with a raw oyster or clam, you want it to be alive up until the moment you serve it. The brief dip in boiling water is like blanching a tomato - it's really just a step to get the thick skin off.